In computer programming, iteration is the repetition of a sequence of code. A loop is a form of iteration. A loop repeats code until a certain condition is met. 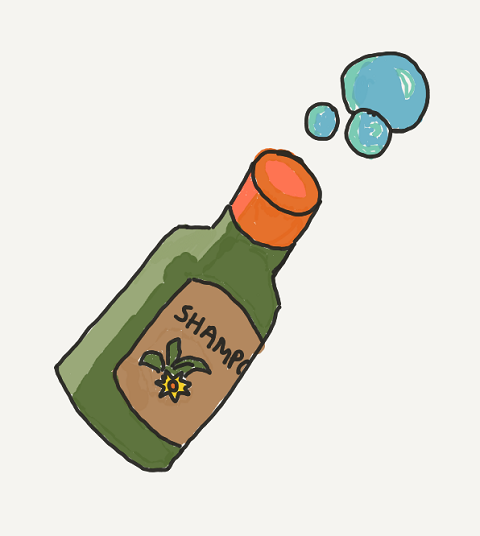 Do you use shampoo to wash your hair? Most will say ‘Yes’. Have you ever read the instructions on a bottle of shampoo? Most will say ‘No’. Most of us have never read the instructions on a bottle of shampoo, because we already know how to use shampoo. If you did read the instructions on a bottle of shampoo, you may read similar instructions as the ones you just wrote with one added step at the end. That step is ‘Repeat.’ How does this one extra step affect the algorithm? In computer programming, this is known as the ‘shampoo algorithm’ and is an example of a loop. It is also an example of an ‘infinite’ or ‘endless’ loop as the algorithm keeps repeating with no condition that ends the looping. Lather, Rinse, Repeat: Hygiene Tip or Marketing Ploy By Lauren Goldstein October 11, 1999 http://archive.fortune.com/magazines/fortune/fortune_archive/1999/10/11/267035/index.htm (FORTUNE Magazine) – In Benjamin Cheever’s novel The Plagiarist, a marketing executive becomes an industry legend by adding one word to shampoo bottles: REPEAT. He doubles shampoo sales overnight. This bit of fiction reflects a small yet significant eddy of U.S. consumer angst: If we REPEAT, are we or are we not playing into the hands of some marketing scheme? It turns out that in real life there’s a reason you should repeat, or at least there used to be. In the 1950s, when shampoos began to be mass-marketed, we didn’t wash our hair all that often–once or twice a week, as opposed to five times a week as most of us do now. Also, we used a lot more goop in our hair. It was the age of Brylcream and antimacassars, remember. Paul Wallace, the director of hair-care research and development for Clairol, says that when cleaning agents in shampoo came up against that amount of oil and goop, “it depressed the lather.” A second application was needed to get the suds that consumers expected. Lots of suds mean that hair is already clean. Maybe too clean (there’s no oil to break through), but consumers like it. At any rate, Wallace says advances in shampoo technology mean that only one application of, for instance, Clairol’s Herbal Essences is sufficient to break through the oiliest hair. The company has stricken the use of both REPEAT and REPEAT IF DESIRED from all Clairol products. Yet a lot of brands, like Suave by Unilever and L’Oreal, still say REPEAT. Others, like Unilever’s Finesse and Revlon’s Flex, opt for the less imperative REPEAT IF DESIRED. Procter & Gamble uses REPEAT IF NECESSARY on Pantene. 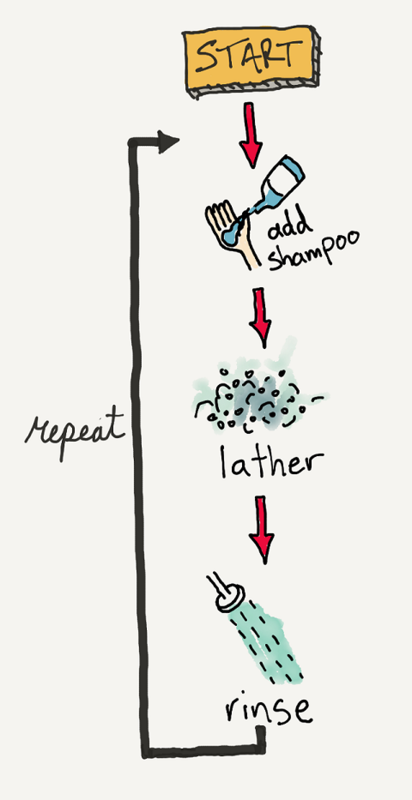 From Wikipedia (https://en.wikipedia.org/wiki/Lather,_rinse,_repeat): Lather, rinse, repeat (sometimes wash, rinse, repeat) is an idiom roughly quoting the instructions found on many brands of shampoo. 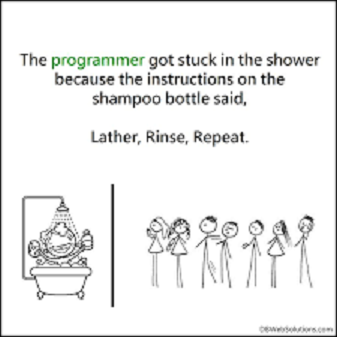 It is also used as a humorous way of pointing out that such instructions if taken literally would result in an endless loop of repeating the same steps, at least until one runs out of shampoo. It is also a sarcastic metaphor for following instructions or procedures slavishly without critical thought.